Hi loves! How are you today? One more day and it is weekend, yay! Because it is Easter we have a long weekend here, so that's quite nice too! My grandmother will turn 72 next Monday (no, not an April fools' joke!) and I am happy to visit her and my family. 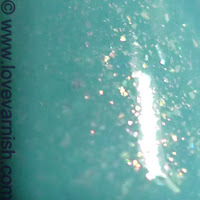 For today's post I got a beautiful color created by Mich from The Polish Well. When she posted this on Instagram I got so excited, but I already spent too much money so I didn't order it. I was so surprised to find a mini in the package she sent me containing my order! Application on this one was tricky. I'll thin it next time as it had a slightly glue like formula. You know, when you want to apply, go over it again with the brush and it just "stretches" underneath your brush? Therefore it also didn't level well and I used 3 coats to get an even and opaque result. It dries mattish so topcoat is needed to bring out the gorgeous gold sparkle. I really liked this shade on me and I hope you like it too! Gorgeous! Too bad about the tricky formula, I hope thinning helps. Such a gorgeous shimmer in this! And how sweet of her to include this with your package! You have a long weekend? Do you get Monday off cause of Easter? That's kinda cool! Then again I always have Mondays off so Monday holiday's have never done me any favors, lol. The shimmer is a stunner right? Yup, Monday after Easter, the Monday after Whitsunday, and the day after Christmas are all days off here. Oh that's nice, always a long weekend for you! Yes it never is the easiest formula :). It does right? I am too ♥. I know ♥. Thanks dear! It really was! And oh well, for beautiful colors I am willing to put in some effort ;-).